Have You Ever Seen A Galaxy ? I mean, not a picture of one. The real thing. A picture is a representation of reality, and as such it conveys to our senses only a pale suggestion of the stimulation that experiencing the real thing provides. In a world where images, still and in motion, have a dominant role in our lives, we tend to forget how different are some things when we experience them directly. Well, seeing a galaxy -getting their multi-million-year-old photons streaming directly through your pupils- is as different from seeing it pictured as tasting a glass of Amarone is different from watching the bottle. I chose a bottle of wine for the sentence above because I know that not everybody likes wine, and to fully enjoy a glass of Amarone requires some palatal skills. 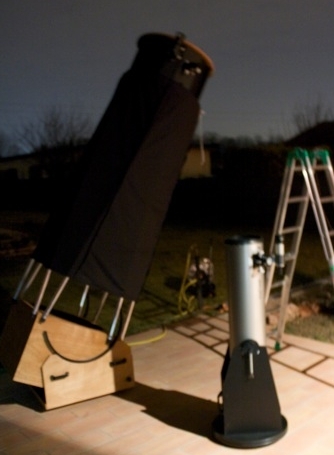 The same goes with the sky's wonders: everybody may like to peek through an eyepiece in a big telescope, but few will fully appreciate the sights, as I have learned through years of amateur astronomy, a bit too often let down by the less than enthusiastic reactions of relatives and friends. So you can see that it was not totally painless. Nevertheless, it was well worth it -at least given the importance I gave to the meeting with those photons. But now take their stand for a moment -let's look at things from a different perspective. Twenty four million years ago a stream of photons is emitted from the surface of a few billion stars in a galaxy far away. Those photons are already quite old: they were created thousands of years before in the core of those stars, and only then do they emerge and leave the stars in straight paths. The galaxy stars emit photons in all directions, but on any given second a few hundred thousand photons happen to travel in a direction so exactly aligned that the angular separation in their trajectories is a ridiculously small number: they have to converge to a target which has the angular size of three billionths of a billionth of a degree. And they run, and run, and run through empty space, for twenty-four million years. They left the emitting stars when there were still dinosaurs on our planet, but now, as they approach us, it is not a dinosaur who turns a telescope in exactly their direction and places his eye on the lens. The photons hit his retina, and the image of the galaxy is collected to be finally enjoyed. 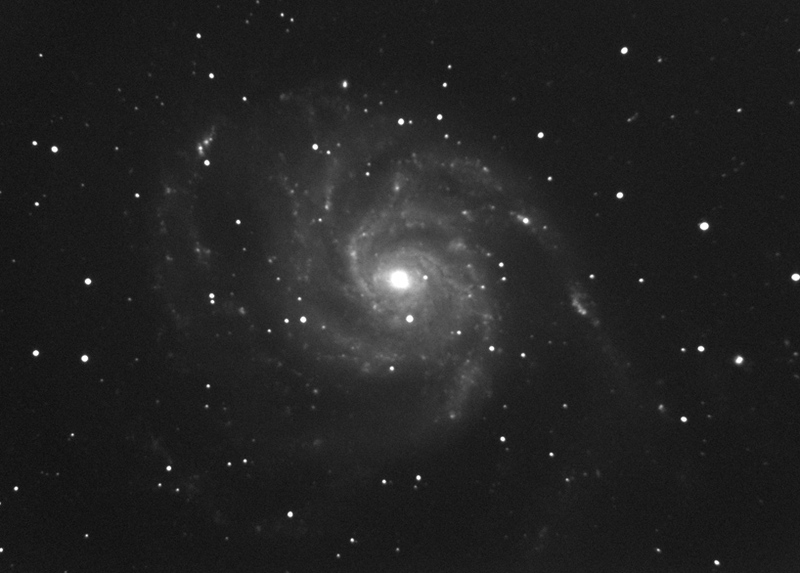 The picture above (credit: bellatrix observatory), which I picked among a set of many much more beautiful ones that may be found with a google search for "M101" -the pinwheel galaxy-, is remarkable because it very closely matches what I could see last Saturday through the eyepiece of my friend Mauro's 24-inch Dobsonian telescope. By looking at the image you should not fail to observe the intricacies of the spiral arms and their asymmetric, broken shape, the condensations within the arms, the central bulge, and a few dark bands. All of that was there, for me to enjoy. The night was moonless (by construction), and very dark even for the alpine site we had picked: it lent itself perfectly to a rich galaxy-observing session, so I observed some forty galaxies during the night. Forty streams of photons, emitted in concert from five hundred million years ago to a few million years ago in directions precisely determined, such that they would enter the tube of Mauro's telescope (see picture on the right) or my smaller 16-incher for a well-timed rendez-vous. And I am not even explaining that in some of the views I could count 11 different galaxies in the same field of view: 11 streams of photons converging into my retina. That is really something! If you consider treating yourself one day to a similar show, start planning now. The photons you are going to intercept have been working their way to your eye since a long time ago already.